Build your own backyard hammock using the kits below or order a pre-made hammock that is ready to use! The Search for the Perfect Hammock! While looking for a hammock for our own use, we were faced with choosing between one made with cotton cord which had the soft feel that we wanted but did not hold up well to the elements or a hammock made with nylon rope which was long lasting but had a rough feel making it uncomfortable to lie on. After spending some time in our search we were able to find what we feel is the perfect hammock. 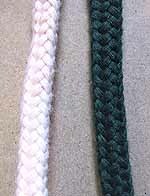 It is hand-woven from a single length of braided spun-polyester cord which has the softness and luxurious feel of cotton rope, while providing the added advantage of a much stronger, longer lasting, and more durable product. This is an extra-large hammock that holds one or two people and has a weight capacity up to 450 pounds. The bed is a comfortable 5 feet by 7 feet and the overall length of the hammock is 13 feet. The handcrafted hardwood spreaders at each end maintain the hammock's even width and there is a steel ring at each end to secure it to trees or a hammock stand. It is available in either Forest Green or a Light Beige colour (an off-white colour). Want to Weave Your Own Hammock? As well as the completed hammock, we are also able to provide hammock kits and an instruction booklet that explains how to weave your own hammock. In addition to providing a way to save money, the kit allows you to create your own hammock and customize the wood spreaders. 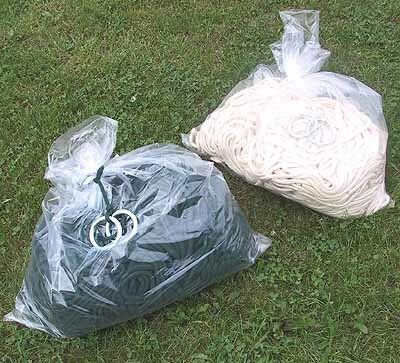 The kit comes complete with enough rope and the two steel rings for the end. The instruction book titled How to Make Your Own Hammock! has full instructions and pictures showing how to weave the hammock. It also provides the dimensions of the wood spreaders (not included in kit) and a simple wood shuttle that need to be constructed to weave the hammock. The instruction book can be purchased with the kit or if purchased alone includes a $10 coupon ($10 CDN for CDN purchasers and $10 US for US buyers) for the purchase of a hammock kit which can be used later. The Hammock kits make a wonderful project for the Do-it-Yourselfer and a wonderful gift for anyone to enjoy the outdoors! 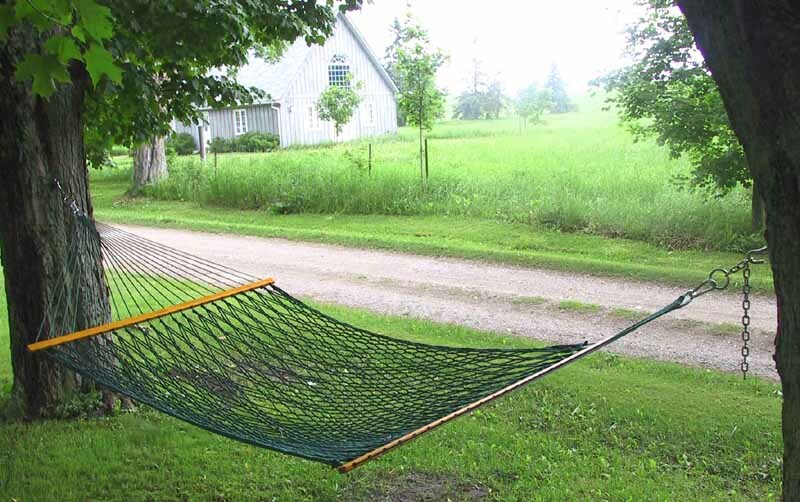 See the description of How to Make Your Own Hammock! for more information on what is required.